The Mediterranean is a solid sea1 crossed by pipelines, cables, pipes, romantic cruises, super oil tankers, nuclear submarines, cargo ships, European fleets, etc. It is Africa’s gateway to Europe, or Europe’s to Africa, and at the same time an abyss, a paradox of the geo-economic global order. A maximum distance of wealth and life chances levels corresponds to a minimum geographical distance, with the South-North movement cruelly restricted, which compels people to risk their lives to do it. In 2002 the SIVE (Integrated External Vigilance System), a technological, military, and police device to “shield” the Coast, came into operation in the Mediterranean Sea. It is a system that enables rapid detection of the location of pateras2 even before their arrival to the coast, allowing to block them in the open sea and thereby precluding the application for the refugee status. The SIVE consists of a system of radars, video surveillance cameras and satellite connection. It works thanks to a computerized apparatus designed for this purpose and allows the police in control towers to follow almost “cinematographically” the misfortunes of immigrants in the open sea3. Every day there are thousands of stories about the crossing of the Mediterranean Sea and the attempt to reach Europe. Stories that are not stories: they are people’s lives. Morocco is bordered by the Mediterranean Sea and corresponds to the last step in Africa before reaching Europe. Within Morocco, two towns - Ceuta and Melilla - already are Europe, which results in a daily attempt by immigrants to enter their perimeter. 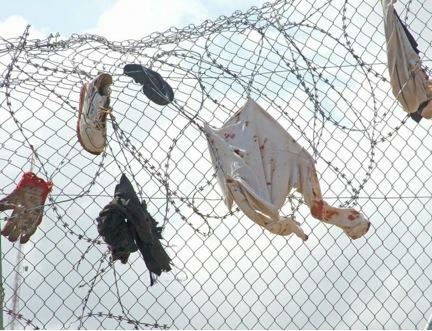 Ceuta is surrounded by the sea and by a grid of barbed wire. If before this barrier was three meters large, now - to hinder entry into the geopolitical space of the European Union - it is six. The first sight of the grid is absolutely brutal: bars that cover an entire mountain, dividing a village and its inhabitants, and that are escorted along their course by two military devices, one on each side. If from one side the environment is a reminiscence of World War I, with dug trenches and soldiers at every 20 meters, from the Spanish side it makes us think about a futuristic war. Typically, Moroccan action prevents European hands to fill with blood. Near Ceuta, in Morocco, there is the Beliunes forest, where until October 2005 over a thousand people waiting for the appropriate moment to cross the border had been camping. Generally, these camps are formed by communities with different backgrounds and are organized in assemblies. They are illegal or semi-illegal camps, which last until the Moroccan police, or the lack of supplies and the spread of diseases require them to dissolve. In these camps - among the most famous there are Beliunes grove in Ceuta, El Pilar de Rostrogordo and Gurugu mountain in Melilla - the situation of these illegal people is difficult and dangerous since, they are at the mercy of all kinds of abuse, not only by Spanish and Moroccan police, but also due to each other desperation, or the arbitrariness of speculators who take the opportunity to do business. In late September 2005 the situation worsened in Beliunes: the camp was grappling with a spread of scabies and the Moroccan militaries kept sweeping the place under pressure from the Spanish government. The various communities of Sub-Saharans gathered in the forest decided to launch two collective assaults on the border. Each was mounted by 500 people, about a hundred of which, in each round, made it through. There were hundreds of wounded and at least 5 killed on 29 September 2005. Jumping off the grate implies a bit of organization: having stairs at least 6 meters long; paying attention to both the police, and be willing to die - and to see the bodies of the partners remaining behind - since, if the Civil Guard (the Spanish gendarmerie) electrifies the barbed wire and uses rubber bullets, the Moroccan army shoots real bullets and transports captured people in trucks into the desert. When an “illegal” manage to reach Ceuta, he has to go to the police station. There, he is recorded as having no papers, and it’s left to local authorities to decide what to do with him: it can vary between deportation and receiving a provisional document, which allows the individual to move into the European territory (without, however, having documents allowing him to sign an employment contract). At the door of the police stations, Civil Guard elements often prevent the immigrants to submit to the authorities, handing them to Moroccan militaries. If they got the provisional document, they are “deposited” in the CETI - Centre for Temporary Residence of Immigrants - a center for 450 people, which arrives to welcome 1700. The most of them come from countries marked by hunger, misery and war: Sudan, Ivory Coast, Nigeria, or Guinea-Bissau, as well as India and Pakistan. In the land around the center the environment is that of a tower of Babel where customs, cultures, and habits coexist in niches. However, even in Ceuta or Melilla, these people are faced with the racist hostility of the Arabs of North Africa, who do not consider themselves Africans and who think that “their” land is not for blacks; with police brutality, who does not hesitate to rip their refugee papers; or with the contempt of vendors, who refuse to sell them food. As different accounts of the same war, these “micro-geographies” are all deeply interconnected, and reflect the global dimensions that relate them to our life in Europe. They are stories of people whose paths are vitiated, and the circuits are repetitive. Their wanderings are embedded in confined spaces, and the trajectories circulate around or between the imperative of territorial boundaries, thus opening State or illegal spaces and not-spaces. Waiting is a constant and daily life is lived for the sake of expectations. In these stories the gap between man and citizen becomes glaring, and we realize that if you are not a citizen, you are not entitled to be a man. The daily life of these immigrants is opposed, in its extreme fragility-strength, to the power that maintains the sovereign fiction of the border and citizenship in an almost organic way. Days go passing by, life goes finding loopholes from where to happen and, in the borderline vulnerability of these states of exception permanently re-updating, insane balances, absurd situations, and strange occupations can be found. There are maximum distortions5 in force of what we consider “normal”, “right “, “healthy”, and “fair”, and this shows the entirely fictional character of these operative concepts. So “Norm”, “Justice”, and “Law” are based on the existence of areas of exception in which life, like that of Sub-Saharan immigrants in Ceuta and Melilla, is liable to be killed, without it constituting murder. The migrations of people and the circulation of knowledge are part of the same process5, which is felt on both sides of the strait and increasingly requires rethinking the very notion of territory. The Spanish enclaves of Ceuta and Melilla, located in Moroccan territory, are exceptions in the frontier line that - if these enclaves did not exist - would follow the coastline. Through funding from the European Union, the Spanish authorities daily re-activate the process of building of another fort, in the form of fashionable shopping areas (tax free zone) and western tourist beaches, last symbols of the prosperity and vigor of the Europe there represented. Moroccan cities, too, include architectural European (or Europeanized) enclaves, in a material interconnection that leads us to think that building reality can only give form to what already potentially exists in minds and speeches. There is a whole control technology that lives on the existence of places of exception like these, where the police are militarized and the army enters the civil sphere. Body, space, and technology produce and maintain the borders, which are simultaneously transgressed and crossed many times a day through emails, sms, home videos, television, and radio. Technology patrols the border 24 hours a day, in a ceaseless detection of bodies moving in space. The division of space and the confinement of the bodies to specific places continue to be two fundamental tools of the discipline of power. The matter is in understanding the Frontier as the visible face of a war that, like it or not, call for all of us together. 1. Terminology used in FADAIAT, which is a network of support for the ‘freedom of movements.freedom of knowledge’. It organizes an annual meeting and aims to ‘reflect on the construction of new territories that cross Schengen borders’. 2. Patera: name of the boats with which immigrants cross the Strait of Gibraltar. 3. This system is implemented in the Canary Islands, the Andalusian coast, Ceuta, and Melilla. It is envisaged its extension to the region of Murcia, Valencia, and the rest of the Spanish Mediterranean. It is the result of a European Union cooperation with the Moroccan government. The SIVE resulted in an extension of the travel routes of immigrants, causing an increase in the number of deaths at sea. The strengthening of the Moroccan border provoked the departure of “pateras” from Mauritania and Cape Verde that, predictably, will one day land to points as far away as Majorca. 4. We recurred to the collection “Relatos migrantes de una guerra en la frontera” (Migrant reports of a war on the border) by Pilar Monsell, published on estrecho.indymedia.org. The web page Indymedia Strait of Gibraltar has been following the situation of migrants on this border, being perhaps the best information channel on what occurs there. This is the first Indymedia to clearly choose not to have a nationalist or regionalist character; it is to be noted that the Strait of Gibraltar is precisely the space between Europe and Africa, and that this information channel chose to report about this territory and not Andalusia, as many argued. 5. It is important to globally understand the important changes that are occurring in the labour market. We can speak of a ‘becoming-migrant’ labour: the characteristics that defined the migrant labour (intense mobility, temporality, informality of employment, low wages, etc.) now extend to the entire population.